The mock-up room for the hotel, which DLG has recently completed. The Rosemonth Hotel and Residences Dubai aspires to be an exotic destination with its progressive design bringing together a sky lobby, beach, and a tropical rainforest – all under one roof. The Rosemont Hotel and Residences Dubai will stake claim to being the world’s first building featuring its own rainforest when it opens next year (2019). In charge of delivering the fit-outs of this first-of-its-kind, super-luxury urban resort destination in Dubai, UAE, is Draw Link Group (DLG), the interior design consultant and fit-out contractor on the striking landmark. The company is working on the execution, design development and fit-out of the project, which will have a 75,000-sq-ft jungle, complete with a splash pool and cafe. The supersize terrarium will use only recycled water collected from condensation and will feature a novel artificial beach — one without sand, Daousser Chennoufi, the CEO and principal Draw Link Group, tells Gulf Construction. The Rosemont Hotel and Residences Dubai ... to feature its own rainforest. DLG recently completed a mock-up room for the hotel, which is located in Al Thanyah District. “This is an extraordinary five-star hotel. At DLG, we have worked with many hospitality brands over the years, but the concept of the Rosemont Hotel overarches many themes, and has made us apply our creativity in developing a super-luxury mock-up room unlike any other. The mock-up room is an example of the hotel’s features that will transport guests from a contemporary setting to nature’s most exotic destinations, including a lush tropical rainforest. “The interweaving of technology to realise the hotel’s concept gives us a feeling that we are building an immersive new world experience,” he explains. 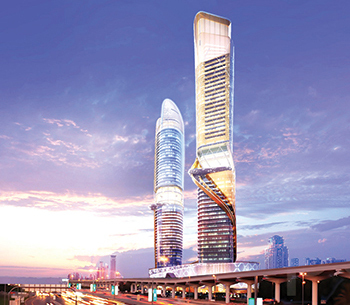 The 1.1-million-sq-ft complex comprises a pair of glass skyscrapers housing a 53-storey hotel and a 53-storey apartment building on Sheikh Zayed Road. The estimated $550-million development will have 448 hotel rooms and 280 furnished apartments, including a 6,300-sq-ft presidential pad with its own private spa, sauna, Jacuzzi and swimming pool with water-fall feature. The hotel will feature a sky lobby, sky roof, health club including a gym and spa, infinity pool, dining areas, VIP lounge and a business centre. 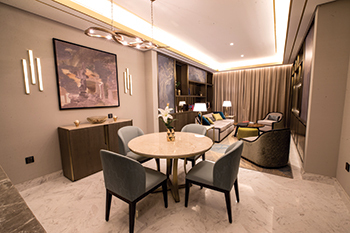 The serviced apartment tower, which also offers a sky lobby and sky roof, comprises exclusive residences, entertainment area and retail facilities. 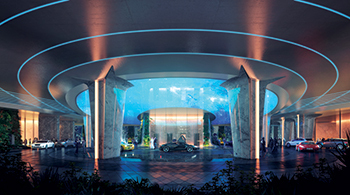 The Rosemont hotel ... an artist’s impression of the drop-off area. 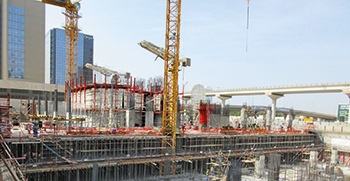 The development connects progressive design, digital technology and the natural world and is being executed in two phases. The first phase comprises the main areas, such as the hotel tower, hotel apartment tower, public areas, food and beverage (F&B) outlets and the rainforest; while the entertainment level will be developed in Phase Two. Resonating a contemporary city where innovative development inspires the destination, the anticipated debut project for new global hospitality brand Rosemont will be operated by Curio Collection, by Hilton. Set against the dynamic backdrop of an ever-evolving skyline, Rosemont’s bold facades reflect the city’s vibrant pulse. Inspired by reflection, light and texture, its evocative design transports guests into nature’s most exotic destination from a lush tropical rainforest to an alluring digital underwater world or cosmic experience, says Chennoufi. To develop the super-luxury feel of the hotel, DLG will be using a mix of carefully sourced natural and engineered materials. For the furniture, fixtures, and equipment (FF&E), DLG has selected pieces that fit an overall contemporary theme designed with sustainability and functionality at heart. The Rosemont hotel combines advanced design, technology and the natural world to offer a new hospitality experience. Some of the natural materials that are used both in the development of the overall design, and in the FF&E include natural stone; marble in some furniture detailing; wood such as walnut and wenge for FF&E and cladding; and tanganika and oak veneers. Alongside the natural materials, DLG will complete the theme by combining a pleasantly accented colour palette with engineered materials such as metal which includes gold champagne, and black hairline used for detailing, and textured fabrics ranging from leather, to suede, and vinyl. “We will be using greige colours, dark wood tones, and champagne gold trims as our main colour palette for the Rosemont project. We will also mix natural and engineered materials to accentuate the theme, so for instance, natural stone and marble will be trimmed with metal for the floors and walls, and natural parquet flooring with metal inlay,” explains Chennoufi. The mock-up room is modelled on these design elements. “The hotel combines advanced design, technology and the natural world to offer a new hospitality experience in the Dubai market,” he adds. Draw Link Group is an international interior design consultancy and fit-out firm specialising in the hospitality sector that offers a comprehensive, personalised and bespoke service. The firm offers a turnkey solution interior design service from concept through to completion, delivering attention to detail throughout the entire process. Headquartered in Dubai with branch offices in Greece, China, and Tunisia, DLG’s portfolio includes iconic projects such as the InterContinental Dubai Marina Hotel & Hotel Apartments, Hawthorn Suites by Wyndham, Radisson Royal Hotel in Dubai and Hues Boutique Hotel in Sharjah. Draw Link Group, which has already won several notable international and regional awards, has been now shortlisted for another global interior design award – in the category ‘Hotel Over 200 Rooms Global Award’ in The International Hotel and Property Awards 2018. The comprehensive and bespoke design services that DLG provides has seen it been honoured with prestigious awards over the years. Some of these include the IAIR award for the ‘Best Company for Leadership Interior Design UAE 2014’, and the ‘Best Hotel Interior Dubai 2011’ presented by International Hotel Awards amongst others.